Hi, lovely readers! I’ve hinted at this big announcement on my Facebook and Instagram accounts, and now I’m ready to let everyone know about a big project I’ve been working on. I’m excited to announce that I’ll be publishing my first eBook in October! 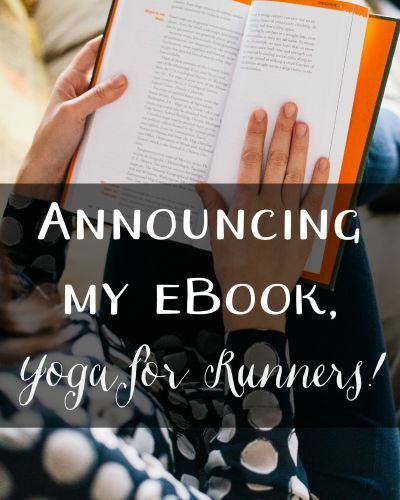 My Yoga for Runners eBook will provide you with a background of knowledge of yoga and how to incorporate yoga into your training. 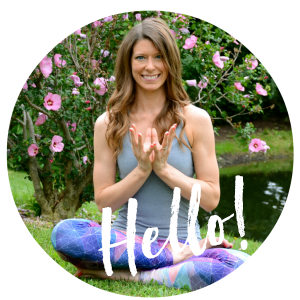 You’ll learn great yoga poses to help alleviate tight muscles and to help strengthen weak stabilizing muscles to help you reduce your risk of getting injured. 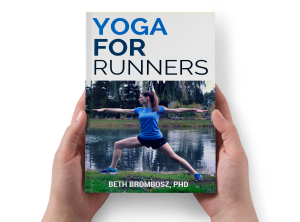 And, you’ll learn how to use yoga to improve your mental focus to get through tough runs. Best of all, the price of the book will be less than the cost of a single class at almost any yoga studio. If you’d like to be notified of updates about the eBook, please sign up for my eBook mailing list. You’ll get early access to the book, and I’m working on a special gift for you if you purchase the book, too! Any topics you want to make sure are covered in the book? « What is Running Economy? Congratulations! It is going to be great! Awesome! This is the kind of book that I need! Yay! Congrats! We both posted about writing books today haha.